In Why the UK Voted for Brexit: David Cameron’s Great Miscalculation, Andrew Glencross offers an analysis of Brexit. While the pace of developments since the book’s publication inevitably makes some of its observations prematurely obsolete, this remains an important and historically sensitive account of this momentous event in the domestic and international political landscape, writes Chris Moreh. Why the UK Voted for Brexit: David Cameron’s Great Miscalculation. Andrew Glencross. Palgrave Pivot. 2016. The UK vote to leave the European Union was one of the most consequentially significant political events of recent decades. An array of writings reflecting on the possible causes of the referendum’s outcome have appeared since the vote, while political developments have unfolded with a speed that few pundits would have foretold. 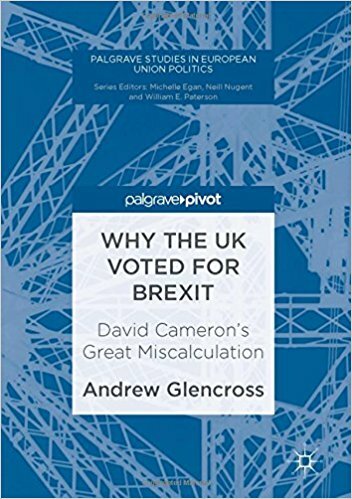 However, while most analyses have intended to identify deep-seated social reasons that determined the outcome of the referendum, Andrew Glencross’s Why the UK Voted for Brexit: David Cameron’s Great Miscalculation has the starting advantage of reasserting that ‘nothing was inevitable about the Brexit vote’ (3). The book has several benefits. It is the first substantial treatment of the political processes underpinning the EU referendum, and its author is not only an authority on European integration and EU-related referenda, but has also closely followed the political debates leading up to the plebiscite. Published as part of Palgrave’s Pivot series – which allows for speedy dissemination of medium-size studies (around the length of three to six standard journal articles) – it can provide a more elaborate yet accessible discussion of an emotionally charged topic in a trusted, authorised format. Composed of five substantive chapters, each presenting well-rounded individual arguments, this work succeeds in carrying through a coherent message that combines historical, analytical and theoretical perspectives. In the first chapter, Glencross examines similarities and differences between the 2016 and the 1975 referendums; in the second, he focuses on the renegotiation of the terms of the UK’s EU membership carried out by then-Prime Minister David Cameron prior to the 2016 vote, a strategy adopted from the previous referendum. In its more recent exercise, however, this approach ‘was a great miscalculation that helped pave the way for voters to reject EU membership’ (32). Other ‘miscalculations’ and ‘missed opportunities’ committed during the referendum campaign – such as the pro-Remain camp failing to communicate a positive message for staying in the EU or to ‘discuss Britain’s contribution to shaping European integration’ such as, for instance, the case of how the European Arrest Warrant had come into being (44–45) – are explored in the following chapter. Next, the author looks at the present ‘business’ of Brexit – or, at least, one version of its fast-changing present, in which participation in the single market is still a likely option posing various difficulties and the destabilisation of the UK’s internal constitutional order raising no fewer challenges. The final chapter places Cameron’s ‘referendum temptation’ in the context of the ‘post-democratic dilemma’ of Western liberal democracies, approached here with the tools of political theory by examining the tension in Jean-Jacques Rousseau’s distinction between the ‘people’ as the true sovereign and the ‘government’ as its representative. Three main motifs emerge in the book’s narrative to explain why the UK voted for Brexit: immigration; ‘British exceptionalism’; and ‘political inequality’ as at least as important as ‘social inequality’ in its explanatory potential. Thus, what is argued for is a distinctively political explanation which is robust and erudite, but without claiming to be exhaustive. In Glencross’s assessment, immigration played the decisive role in the referendum: ultimately, David Cameron’s renegotiation was bound to fail because ‘it was the numbers of new migrants not their access to benefits that exercised anti-EU voters’ (32). At the same time, the referendum campaign suffered inherent limitations that tied in with a ‘British exceptionalism’ that manifested itself in various forms. The author proposes that one should understand the referendum through the backdrop of a ‘four-decade-long debate or “neverendum”’ (9), stemming directly from the UK’s fundamental ‘accountant’s mindset’ in respect to its membership of the EU ‘club’, which is distinct in many respects from continental variants of Euroscepticism. For one, ‘hostility to the EU, unlike in comparable European countries, is nurtured by a neoliberal elite with influential media ties’ (40). This ‘elite version of Euroscepticism’ was to a great extent responsible for ‘the tendentious EU-related coverage’ that led to ‘a persistent information deficit amongst British voters’ (18). These arguments are supported by an expert analysis of voting behaviour in other comparable referendums on particular EU treaties, yet assertions such as that ‘the political history of British exceptionalism […] explains why in 2016 the UK, alone amongst its EU peers, held a referendum on staying in the club’ (8) are fallible inasmuch as it would require a deeper inspection of the particular reasons why other Eurosceptic movements have not (yet) achieved their populist aims. Overall, Glencross argues forcefully against resorting to direct democracy to address complex constitutional issues such as EU membership, however ‘convenient’ it may be for governments to employ this Rousseauian mirage of sovereign decision-making by ‘the people’ themselves. Referenda on international treaties are moreover treacherous, Glencross notes, because in practice they are often overturn by means of political manoeuvring and become self-defeating, or have no real effect since the ‘exercise of democracy’ still remains with the representative governments. At the time of sending the book off to the printing press, it still appeared that the post-referendum UK, with its ‘new, notionally pro-EU Prime Minister alongside a Parliament that retained an EU-favourable majority’ (70), was inevitably heading down this route, with the ‘Brexit’ process potentially ‘conducted on terms that do not actually satisfy the vast majority of Leave voters’ (1). It is still theoretically possible that ‘Brexit never happens […] a notion that would have sounded farcically far-fetched on the morning of 24 June 2016 when separation from the EU appeared so decisive and imminent’ (71). Yet, following the developments of the past few months, it feels like an even less likely ‘notion’ than it did in the referendum hangover. In fact, the book’s Achilles heel may prove to be the author’s implied doubt that the UK government would be willing to take ‘a huge economic gamble’ instead of further exacerbating the ‘crisis of representation’ (72). Despite the pace of events, Why the UK Voted for Brexit is still a very timely book, although it is precisely the chapter dealing with our present ‘unfinished business’ that feels most likely to obsolesce ahead of its time. Its detailed and historically sensitive discussion of the referendum process will nevertheless remain an important document for those seeking to understand this momentous event, while its theoretical foray opens up comparative analyses with broader global phenomena driven by ‘Rousseau’s revenge’. This post represents the views of the author and not those of Democratic Audit. It first appeared at the LSE Review of Books. Chris Moreh is a Research Fellow at the ESRC Centre for Population Change at the University of Southampton. He tweets @CGMoreh, and his writings are available on academia.edu. Read more by Chris Moreh. btw another interesting point, about the flawed idea of a media elite taking control of the agenda. In reality we are of course talking about Murdoch and the Mail group of course. The argument though does not stack up. If some tiny little elite of eurosceptic owners involved in the media cornered the market, why is it that Murdoch’s Times campaigned for Remain and The Mail on Sunday campaigned for Remain as well, alongside Guardian, Independent, Mirror, Evening Standard, Economist…not exactly a united show by shadowy ‘media elite’ is it? The danger with all comment, however useful, is that when those who are fanatically pro-EU (like the book’s author) venture forth, they inevitably talk about “an information deficit” if their ‘side’ loses a referendum. This, interestingly, was what was said when the Irish elite lost its pro-EU referenda – in the end there, it was to take the dramatic and anti-democratic step of abandoning fair media coverage rules and loading the dice totally in favour of the EU’s case by ending the obligation for the concept of balance and even treatment on state radio and tv. Maybe this is what Glencross means – the state should end its obligation of allowing anti-EU forces to be allowed the right to be meaningfully heard. “In the interests of democracy”. When governments are unpopular over measures, they often retreat into “we’re not getting our message across”. Well, get it across then. If you have a case. The Remain camp last year used flawed and failed tactics – described everywhere as Project Fear & Lie – to terrorise the voters into believing that an apocalypse would occur ‘immediately’ after any vote against the elite and its EU project. Never forget their falsehoods and terror tactics. Pensions would be ‘slashed’, and recession was ‘guaranteed immediately’. ‘Punishment budget’ required – ‘the very next day’. Remember the absurdities of these people talking about a ‘third world war’ if the voters refused to obey the elite? No wonder they were laughed at in the end. The elite would do the same again in another referendum. There really is no case they can make that is positive without raising awkward issues of democratic control. Which is why they will not and never do so.